Spring is finally here. Thank you! I must admit, I found it really difficult getting through the winter. More so than other years. It could probably be because this past summer, with our travels to Western Canada and Austria, I really didn’t feel a lot of the heat that people who stayed in Toronto felt. I longed for the hot, humid days – and I don’t like humidity! This year, winter just seemed to go on forever and ever. But, like I said, spring is finally here! So I’m happy!! YAY!!! 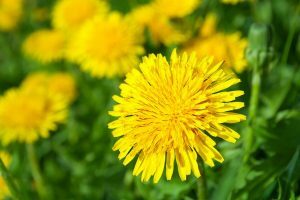 I noticed a few days ago that the first dandelions appeared in our backyard. I know that they are considered to be weeds, but I love them. To me they are flowers. The bright yellow plumps of happiness greet me when when I open my bedroom window in the morning and they bring a smile to my face. I know that they take over the lawn and I’m OK with that. It doesn’t hurt that yellow is my favourite colour as well. Not only that, they are resilient little buggers. Did you know that a dandelion has the strength to break through a layer of asphalt? I wrote about my experience watching my driveway crack and revealing a little surprise on my personal blog Smartie Knows. The post is called Watching The Pavement Grow and you can read about it by clicking here. It was a pretty awesome experience. Declutter and get rid of everything you don’t need anymore. And I’m not just talking about inanimate objects either. Take a long hard look at what brings you joy and what doesn’t – including belief systems, people and habits. Reassess your goals – are they what you want? Or have you be striving toward them out of habit? Open up the windows. Not only does it replace the stale air from the winter, but it gets rid of all the stagnant energy that collected there as well. Go outside. Walking gets the blood flowing, improves your cardiovascular system and just put you in a darn good mood! And really have a look around you – notice the buds on the trees, the song of the birds and the flower blossoms. Watch what you eat. We are entering the time of year where we have fresh local produce available to us. Support local farmers and also yourself by nourishing yourself with these awesome, nutrient rich foods. Be social. With the more daylight hours available to us, it’s time to step out of hibernation and connect with fellow humans. Not only is it fun, but it’s so good for our help. Connection increases our longevity and long-term health. Studies have shown that people who have satisfying relationships are happier, have fewer health problems and live longer! Smile. Do I really need to go into the reasons why?